Rock Canyon Poets and Pioneer Book are please to present Utah poet Fish Burton! 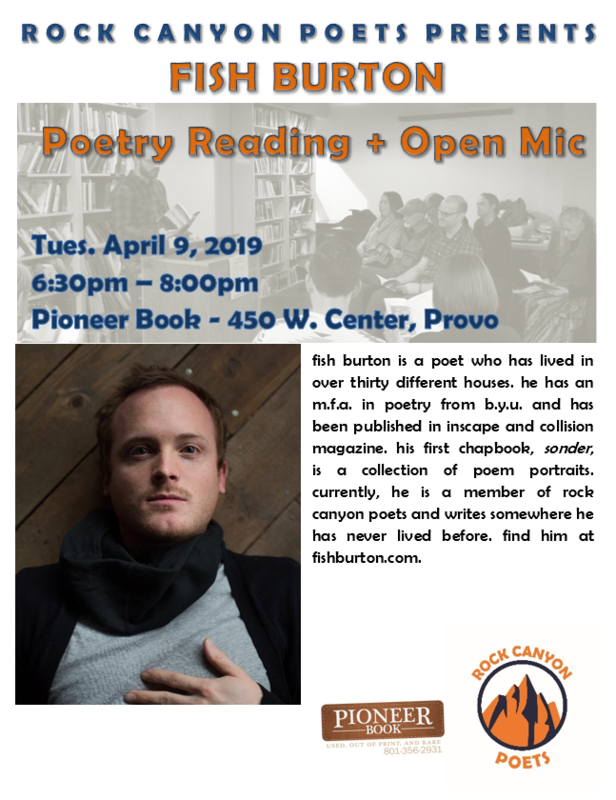 The event begins with an open mic at 6:30pm and runs until 8:00pm at Pioneer Book (450 W. Center) in historic downtown Provo on Tuesday, April 9, 2019.
fish burton is a poet who has lived in over thirty different houses. he has an m.f.a. in poetry from b.y.u. and has been published in inscape and collision magazine. his first chapbook, sonder, is a collection of poem portraits. currently, he is a member of rock canyon poets and writes somewhere he has never lived before. find him at fishburton.com. Burton visits Pioneer Book as a guest of the Rock Canyon Poets and Pioneer Book. The reading and open mic are open to the general public.